Revenge takes Curry on a perilous course to freedom. He finds Paradise in the South Sea Islands, but shipwreck triggers a wild run for life on the most feared coast on earth. Can he escape the civilization he despises or will it destroy the world around him? Early history of New Guinea is scant at best. More is known of Tahiti, Hawaii, New Zealand and other islands of the Pacific - but it is recorded that the New Guinea warriors were fiercely defensive of their homeland, and in the Empire building age, this fiction may be closer to the truth than we know. 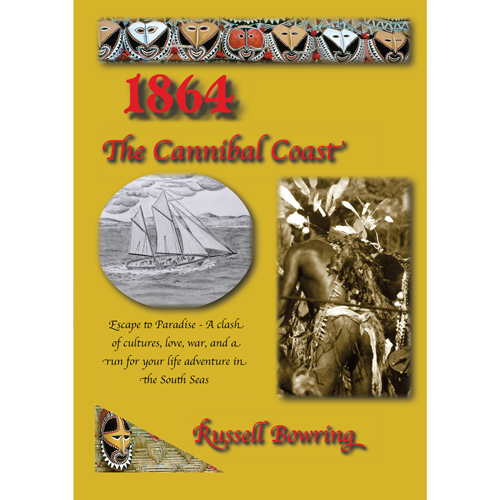 1864 - the Cannibal Coast, marks the beginning of the series. The first sequel, Hai! Singapore will follow later in 2011. An adventurer in real life, the author lived in the landscape, and explored some of New Guinea’s most remote regions in the 1960’s. Enjoy the adventure, suspense, and romance of paradise!